Well, he says the bike's still in his shed but he just can't find it. I think I'll leave him with that lovely misconception. I have no intention of going for a show-winning finish; this is going to be more like a wash and brush-up. The only thing that will replaced from scratch is the wiring loom as I really don't want to get caught out by the failure of thirty year old wires while in the middle of nowhere. I also need a headlight and brackets of some description and a replacement fuel tank filler cap. Guess why. Bridgestone Trail WIng on the rear and a Metzler ME33 on the front. The chassis kept trying to turn into my legs (probably the forks not aligned properly) and I actually had to push the bloody thing downhill because the rear brake was binding slightly. So... having got it home and now having two flying bricks, it seemed like a good move to build a jig to support the frame while doing a spline lube. I made as a bolt-together framework so that it could be stored flat against the wall when not in use. Yes, it does need/will get a coat of black Hammerite and also a top clamp as suggested by Bill (indian036). Surprisingly, the swingarm came out really easily. I was expecting a similar fight to the one I had when trying to get the swingarm out of LFB (Low Flying Brick - my original K100). On LFB both the pivots were almost solidly corroded in; the rightside one still bears the marks of the fifteen-inch pipe wrench I used to break the corrosion seal with. As expected, the clutch boot was completely destroyed. 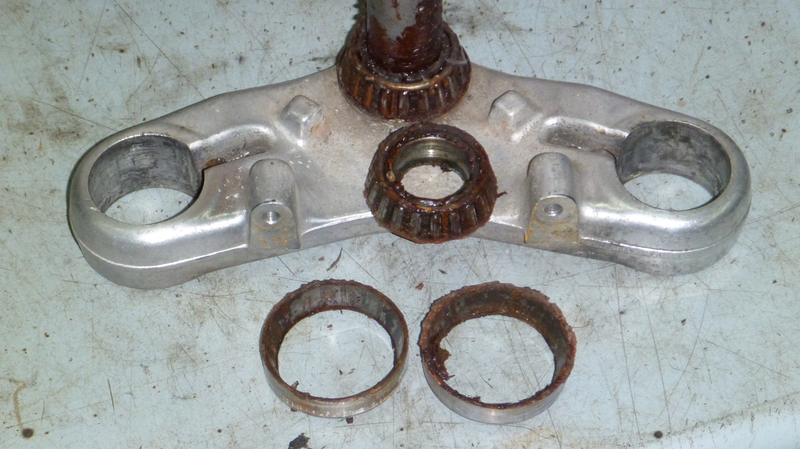 The clutch bearings also had a light coat of rust on them but a good clean with a wire brush and a dose of Tru Blue grease later they were ready for re-use. I hate cleaning the sh!t out of the gearbox castings. Nothing more to be said on that. Again, surprisingly, the clutch arm pivot was completely free. When I got it off, I found out why - the original one had obviously seized and a PO had replaced the bearings with what appears to be bronze or brass bushes, then turned up a new pivot pin. I didn't bother to check the clutch friction plate. Actually, I think that should be re-phrased as 'I couldn't be bothered to check the clutch friction plate'. I just hope it doesn't come back to haunt me too soon. While I was messing about in that area I replaced the gear position indicator switch with one I'd prepared earlier. Spline lube completed and new clutch boot ordered from Motorworks (along with a s/h fuel tank filler cap), time to consider the next move. While waiting for what I hope will remain a very short spares list, I decided to start the wiring loom. 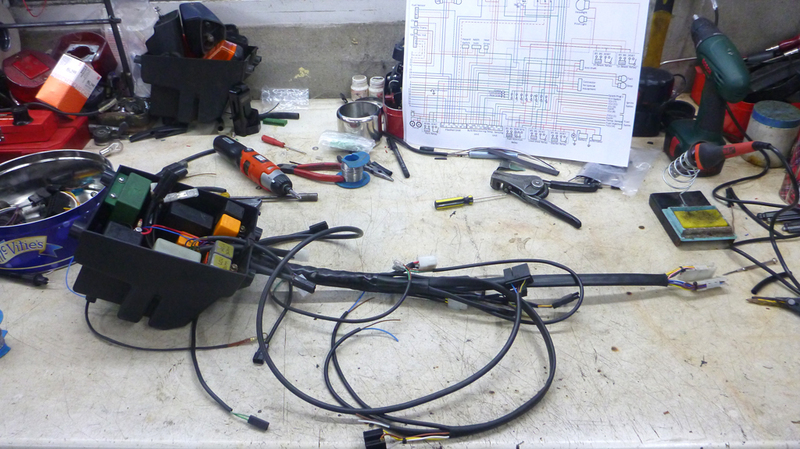 If you mentally pick apart the K100 wiring diagram it becomes pretty obvious that both the FICU and the ICU are on completely separate sub-looms. Apart from unplugging them, you just need to remove the earth bolts on the frame spine. Both sub-looms came off easily enough but the ICU revealed one (minor) difference between the series 1 and series 2 K100s (I can call them that?). On the series 1 the cable for the Hall Effect sensors goes down the left side of the main loom, across the frame cross-brace and back up the right side of the loom before emerging and plugging into the HES. On the series 2 it just pops out the back of the ICU connector and directly into the HES plug. Someone will probably take ire with my definitions of 'plug' and 'socket' but here goes. A socket has one or more live feeds in it and contains female terminals. A plug has no live feeds and contains male terminals. If a connector block is mixed male and female terminals then only the female terminals have a live feed. One other thing too. I always have a continuous earth loop in my wiring looms and I only pick up the frame/engine to ensure that they are kept at the same electrical potential as the earth loop. I don't use the engine or frame as an earthing point. This habit dates back to the days of fighting Joe Lucas for every available volt or part thereof. The FICU sub-loom in progress. You can see the original one in the background. When LFB was new and I was still poking around it to see what made it tick, one of the things I did was to change the air filter. A few days later LFB came to a sudden halt exiting a righthand bend and just would not restart. I was taken home by the recovery people (again! they're fed up with rescuing me for punctures by now). A few days later I finally identified the source of the problem as a loose connector on the airflow sensor. Considering how tightly they grip the AFS I suspect that it was already loose when I got the bike and fitting the replacement air filter just finished it off. I really did cuss at the airbox and finally ended up chopping through the loom and fitting a four-way connector to make life easier. I've added the four-way connector on this loom too. It's been over a week since I ordered the clutch boot and it still hasn't arrived. Must chase Motorworks to see what's happened. I like this thread Dai - thanks for posting. I can identify with the air box cussing! @rawdonball wrote: I like this thread Dai - thanks for posting. Dai, are those injector/FICU plugs and boots brand new or really good secondhand ones? The FICU was scrubbed and cleaned up by yours truly. I've done three FICU main connectors now and they've all come up the same. If you bear in mind just where that socket is, it does tend to catch a lot of road dirt and ends up looking worse than it really is. I've tried searching for new but I drew a blank even with AMP, the OEM. [Edit] It's a bit late to edit this (today is Oct.12) but it's just occurred to me that it's missing a vital piece of information. The female terminals for the FICU connector are still available but I found that the Junior Timer terminals will also fit and they're less than one-third the price (£0.25 each as opposed to £0.90 each). These terminals also fit the ICU. AFAICS the difference between the two terminals is that the more expensive one has an external leaf that will create more grip when the socket is pushed home. This suggests that it's designed for multiple connect/disconnect scenarios which is not the case with us. I stand to be corrected? @Dai wrote: It's been over a week since I ordered the clutch boot and it still hasn't arrived. Must chase Motorworks to see what's happened. I sometimes astound myself with my all-encompassing brilliance - NOT!!!!! I checked the Parcel Force delivery number and WTF? I signed for it on Sept 29th? I did? There's my dying spider clearly displayed on the screen? It's in the box on the bench approx nine inches from where you're working. 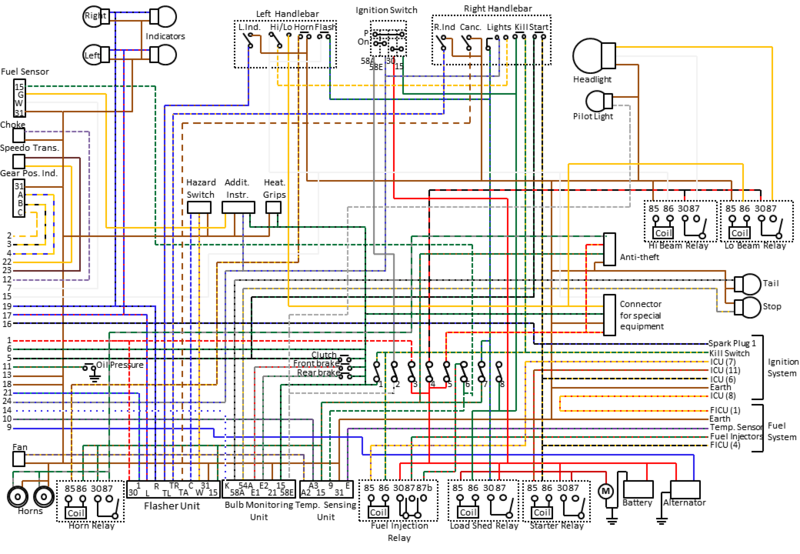 I've said it before, but I'm not a fan of wiring diagrams that place the components 'where they are on the bike'. It leads to far more lines than necessary and, IMO, makes the diagram harder to read. I also find that re-drawing a complicated wiring diagram into a purely topographical diagram helps understand where and what is going on.This is Brick2's bog-standard diagram re-drawn: note that there is one deviation from standard and that is I have included headlight relays as part of the main loom (driven from the normally unused fuse 4). I presume the colours match the actual wires? Yes. There's a minor discrepancy in the BMU pin K to the instrument panel pin 14 in that it's a white/blue wire but the diagram makes it look more like blue/white. New wires on the righthand switch. ...and a pair of refurbished switches. Minus a horn switch, of course. Replacement fusebox fitted to the relay box. To do this I had to carefully open up the original fusebox hole to take the much larger replacement. I've spaced the new fusebox inwards by 5mm to allow the cover to clear the frame at the top. Spacing it inwards also meant having to allow for the cover retaining tags, hence the small rectangular hole to the right of the buttonhead allan screw. There's corresponding one at the top but it's just out of view. The original BMW fusebox is only seven fuses, so the bottom holder can be used to carry a spare. Unfortunately three of the battery anti-vibration mounts are completely useless. These actually pulled straight out with no unscrewing needed and I thought I was going to have to open up the gearbox threads to 8mm because of corrosion. As it was, just running a 6mm tap down the threads revealed that for some miraculous reason, the mounts had rusted but there was no corresponding ally corrosion in the threads. The fourth one is showing some reluctance to come out so it can stay there. I had to take the alternator out on Saturday to do the monkey nuts. They were toast but they were on my list so had a spare set to hand. I also have the same issue with the battery tray and all 4 mounts are loose. I was looking at different options including sticking them in permanently. Now I see a better solution!!. The standard mount is 20mm dia but there's plenty of room to take these. Use a button head allen bolt to secure the tray because a standard allen is too tall. 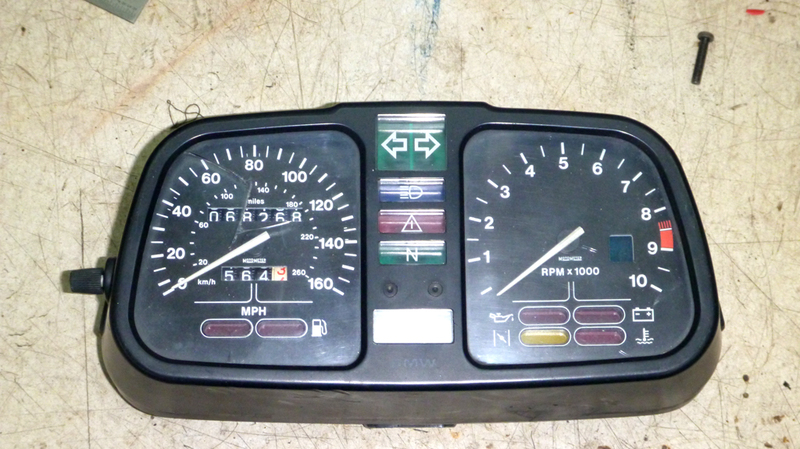 The unfortunate donor arrived this morning - a leftside switch from a K1100. Bloody expensive piece of red plastic, that. All cleaned up and fitted. Relay box completed. The two plugs on the short tails are one for the FICU and one for the ICU. 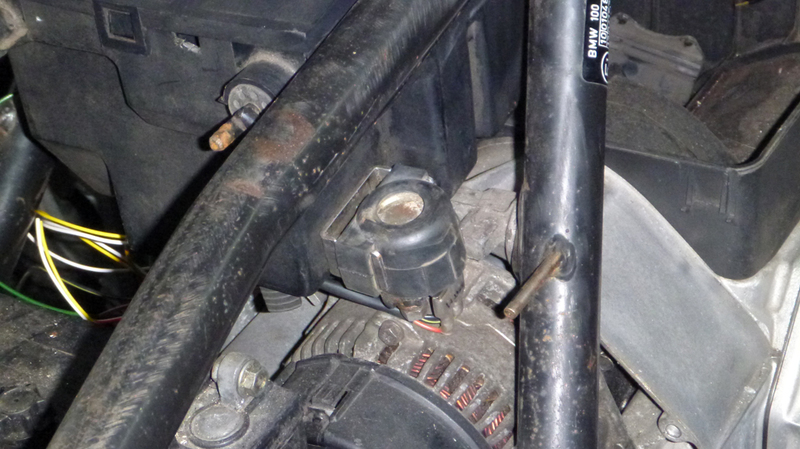 The headlight relays are lower-left and the horn relay has been relocated to the centrepost. 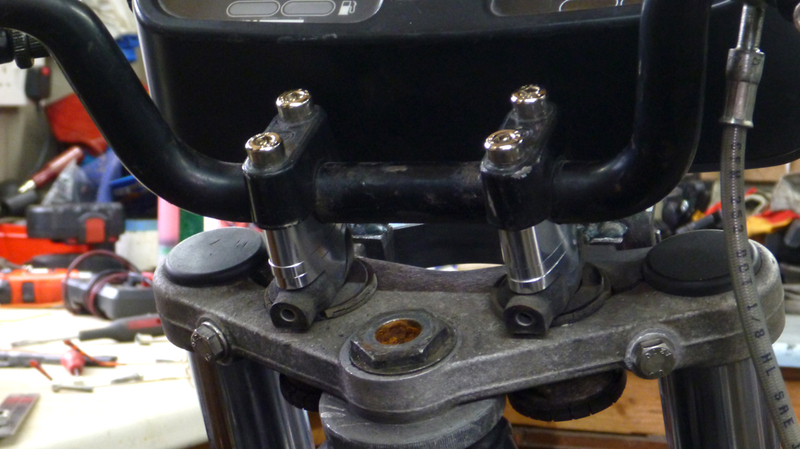 I also applied the every-ready pipe wrench to the remaining battery anti-vibration mount. Unsurprisingly it too pulled straight out with nothing left of the threads. There's a set of ebay's finest anti-vib mounts in the gearbox now. Hi Dai, I'm interested to ask about your headlight relays arrangement. You've chosen to have a single pole single throw relay switching the incoming power supply to a single pole double throw relay to switch between Hi and Lo beam. Is there an advantage over using two single pole single throw relays, one for Hi beam and one for Lo beam with the incoming power supply looped from one to the other relay? Both methods still require two relays. Good question... (scratches head and can't for the life of him remember why he does it that way...). 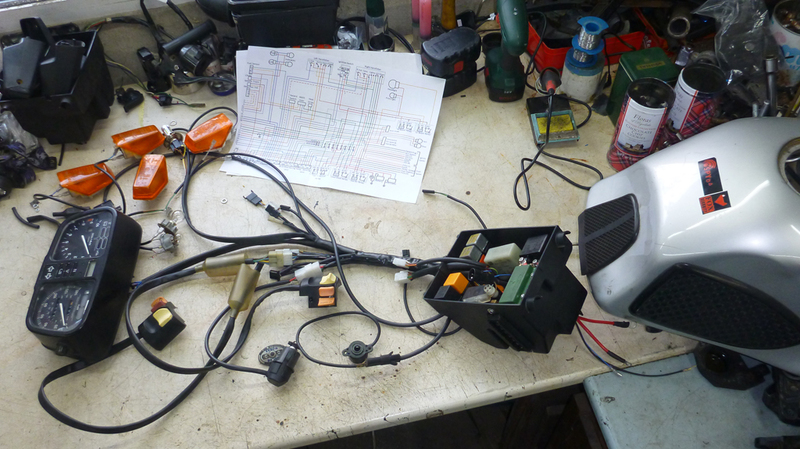 Because if I'm doing a loom for a custom bike I normally use the power relay to switch the feed between the starter motor circuit and the lighting circuit. Thumb the starter and the lights go out, so shunting all available power to the starter motor. 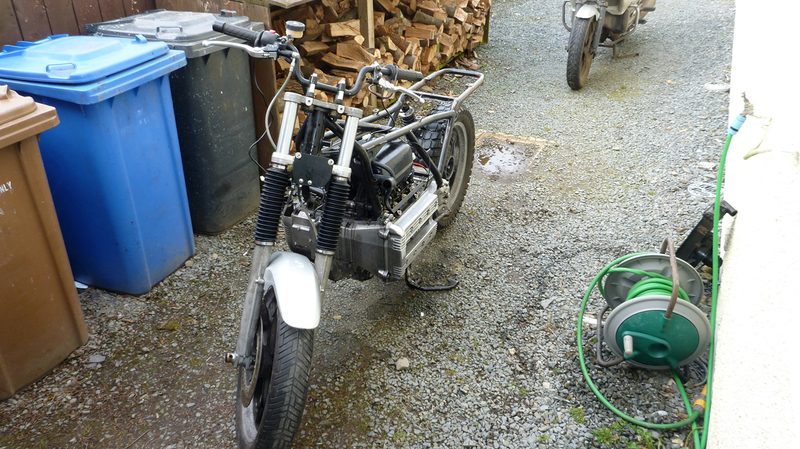 It's a Guzzi habit because the early Tonti models were a bit marginal between the battery size (28Ah) and the Bosch starter motor (400A surge and 140A cranking current), but I apply it to every custom loom I design. In that case though, the light feed will be on pin 87a rather than pin 87. Also it means one wire less in the main loom - you only need the high beam wire to energise the headlight relay. This loom still has the dip beam wire simply because it's required by the Connector for Special Equipment, otherwise it wouldn't be there. The short answer is because it's become a habit. As you say though, on this loom either method would work successfully. [Edit] Aaaaannnd.... cr@p. I realised today that that setup isn't going to work; or rather, the flash won't work . Back to the Powerpoint board to put in two switching relays as you mentioned. 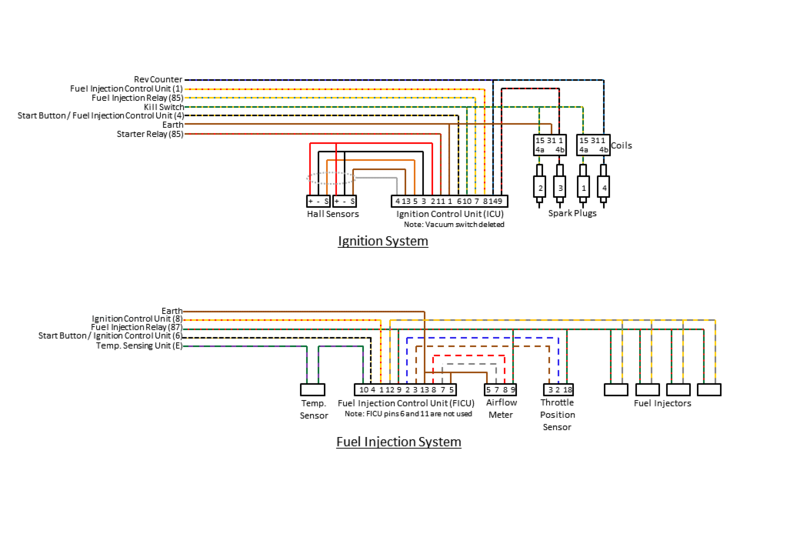 Wiring diagram updated to show change of relays - thanks Gaz. You may need to hit F5 to clear your cache and show the new diagram. One good satisfying smack with a three-pound lump hammer and job done. I still add the bit of heatshrink for the finishing touch. So, main loom finished, except for the indicator terminals which I realised weren't done after I'd taken the picture. I thumbed the starter button, the engine cranked and absolutely bugger-all happened. Then I found out that if you want fuel to go bang, it really helps to reconnect the spark-plug leads. You can just see them hanging down at the back of the engine. This time LFB did fire up and almost immediately the fuel pump cut out and it all died. It did this consistantly; absolutely indicative of the temperature sensor playing up. As I'd jumped the temperature sensor into the new FICU subloom with a pair of bared wires, I wasn't that surprised. The resistance must have been stupid-high compared to what the temp.sensor unit normally sees. So I counted the test a success. Fortunately LFB fired up without demur after I'd reassembled her. That just left the main loom to bench-test. I'd got the theory figured out in my head and I just needed to repair the instrument panel that came with Brick2. The speedo glass was cracked and the GPI was toast. Not a problem. 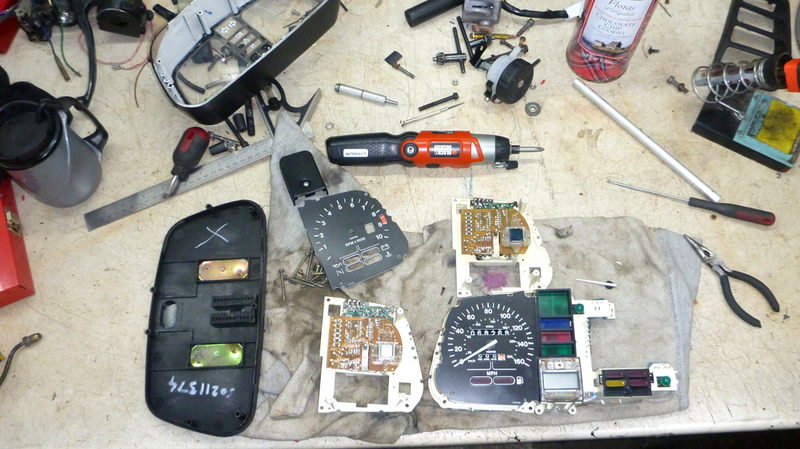 I'd amassed a few instrument cluster spares, so I located a top cover and a spare GPI which, IIRC, was just starting to bleed from one segment. 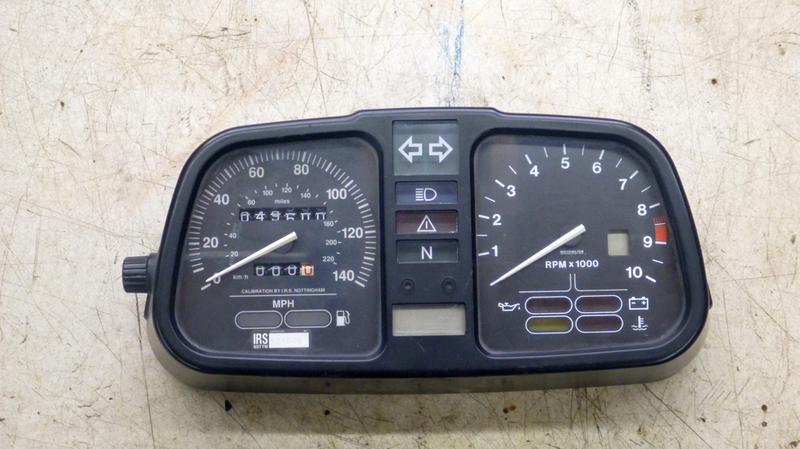 After I'd screwed the tacho plate back on I flicked both needles to ensure the damping was working correctly and the speedo needle just went round... and round... and round... turned out the pivot was broken. Okay (sigh) find a spare speedo and screw it in. Then I discovered that at least one of the long terminals that hold the instrument sections together was no longer attached to the PCB. Fortunately I had this in another box. Yes, Olaf - I have no excuse for speeding either now! 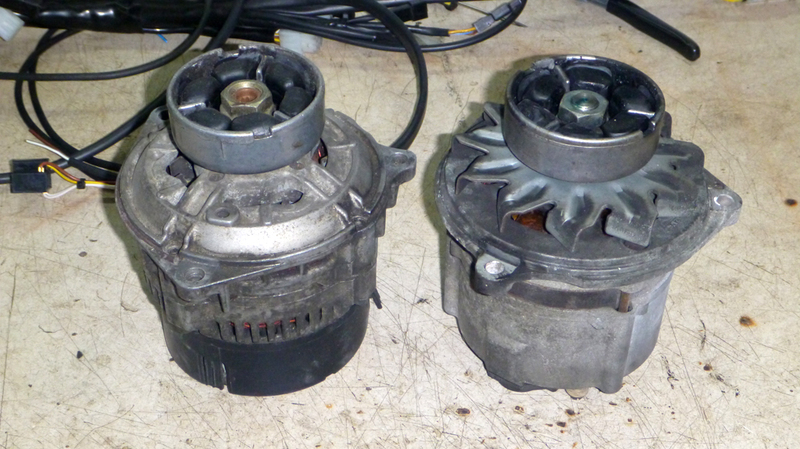 Oh yes - and just because I could, I switched out the original 33amp alternator for a 50amp LT one. I'm probably going to regret not cleaning it first. 50amp on the left for those not familiar with them. I like the battery terminal crimper but wouldn't you be better squeezing it in the vice rather that hitting it with a BFH ? Nah - it's designed for a BFH. The plunger is spring-loaded to hold everything in place while you take out your frustration on it. Great stuff Dai, thanks for documenting this. Really need to get me a fancy crimping tool soon. @floyd: I bought that crimp tool thirty-odd years ago and have never seen a comparable one since. It cost me just under a half-day's wages back then. I've just had some potentially bad news about Brick2. I applied for the change-of-owner off-road notification and today received a letter from the Driver and Vehicle Licensing Agency telling me that Brick2 hasn't been taxed since before 31st January 1998 (when the law regarding off-road notification was introduced). This means that it's unlikely to have been run for at least eighteen years. So, no 'just change the fluids and hit the button'. At the very least I'll have to pull the cam cover and the sump cover to gauge the condition of the engine. 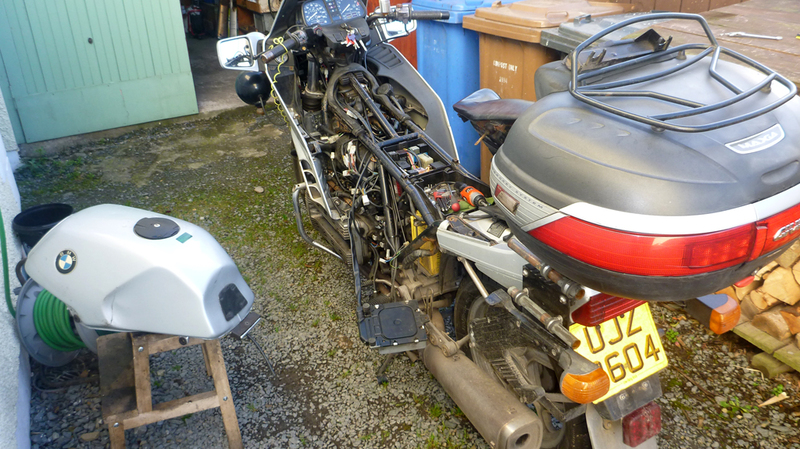 On the upside, the general condition of the bike implies that it's been garaged for all of those eighteen-plus years. There's a 12-volt power supply just out of sight to the right of the tank. Turned it on, the neutral light and the BMU light came on but nothing else worked. I gave the GPI switch a quick spin with a screwdriver and it successfully displayed 0-2-3-4-5-1 and round again, but not a sodding thing else worked. Power off, start troubleshooting with a multimeter; nothing obviously wrong. Some time later (well, really, a long time later) it slowly dawned on me that earthing out the load shed relay would be a good idea. Actually, it would be a Very Good Idea. 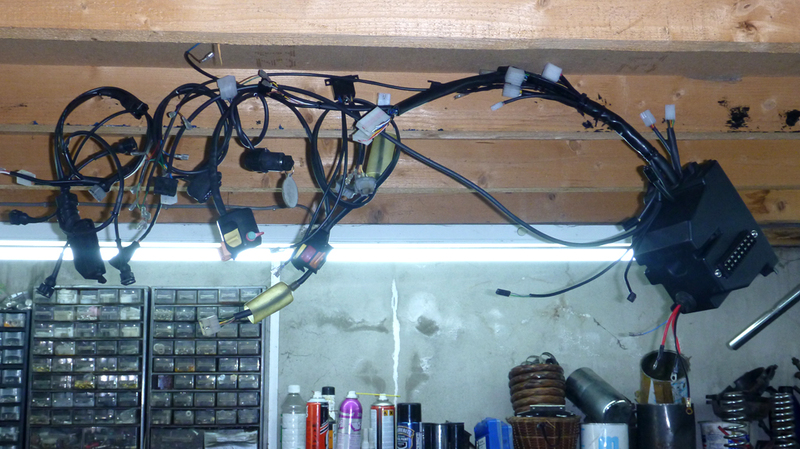 Things tend to work on a BMW K when you earth out the load shed relay and yes, that's what happened here. Almost. Everything except the right side indicators and the dip beam powered up. I then had a better idea and went to find the bottle of Blanton's 'Gold' bourbon that lives in the utility room. The following day (Sunday) I came back to it. 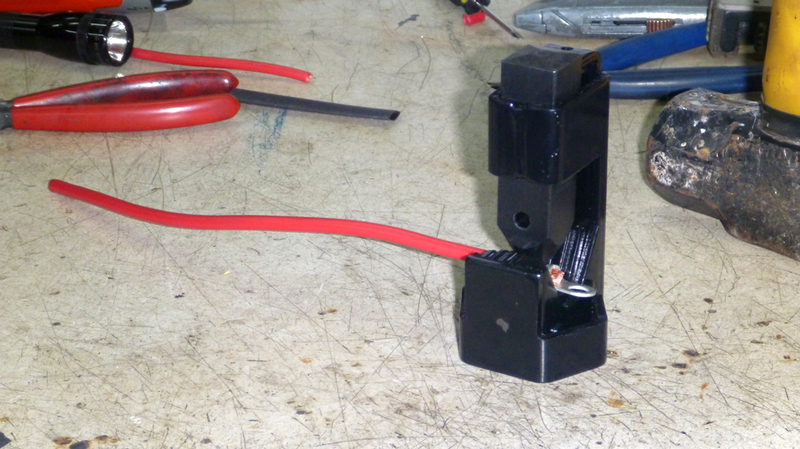 Testing the BMU and brakes was easy; I just short-circuited the sockets. Front brake okay, rear brake no. No righthand indicators either... Cutting a couple of hours of cussing and hair-tearing short, what are the chances, when having six indicators to chose from, of picking the two that have no bulbs in and plugging both of those into the righthand circuit? In fairness though, it also turned out that the flasher relay was fubar so I was up against two problems at the same time. 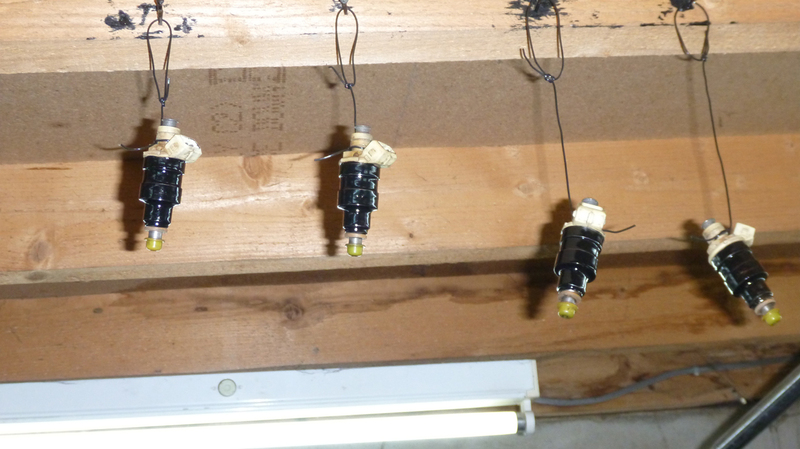 Testing the hazards was another case of just shorting out all three plug terminals with a bit of bared wire. The dip-beam problem was something else again. I use an LED H4 for testing because it doesn't generate heat and I can push it around the bench without worrying that it's going to melt part of the wiring loom. Everytime I switched to low beam the bulb flickered and went out. If I disconnected the high beam indicator in the instrument cluster, the dip beam worked! Surely I must have cross-wired something? Yellow and white are the only two colours in the entire loom that BMW have used for two different purposes i.e. two different circuits. I was convinced I'd cross-wired it but I couldn't find out where. Back to the bottle of Blanton's. On Monday, before I went to work, I took another flyer at it. Eventually I had the brainwave of changing the LED H4 for a halogen and yes, it all f*****g well worked properly. There was nothing wrong - the LED H4 was bolloxed internally. Approximately six hours of troubleshooting, all for nothing!!!!! In the end, only the rear brake problem turned out to be a wiring fault. In this case the black-green feed wire between the brake switch socket and the BMU was isolated from the rest of the black-green circuit. It was the work of a few seconds to link it in correctly. Job done and hung up out of the way. 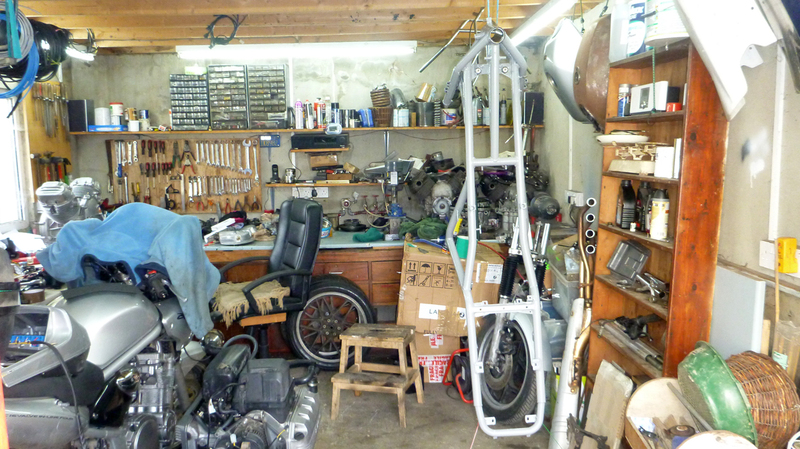 Now to do that damn Royal Enfield that's clogging up access to the rest of the garage. That Blantons stuff has you working like a Trojan.......now there's your next project. A Trojan!!! So, at some point I mentioned that I'd already started work on the hydraulics while waiting for new wiring parts to arrive. 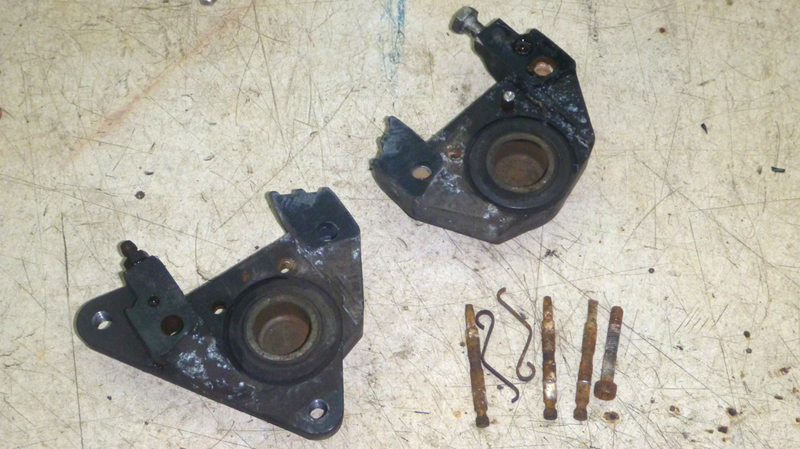 The pad pins were rusted solid into the calipers but a bit of abuse with a drift and a hammer removed five out of six. I couldn't get the pads out - they too were rusted solid which explained the difficulty I'd had pushing the bike home. 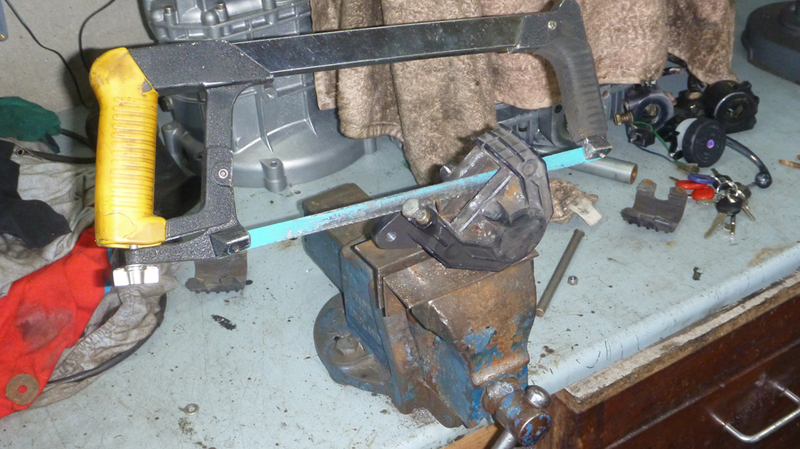 I removed the two front calipers (ComberJohn had already removed the rear hydraulic system) and clamped the one with the recalcitrant pin into the vice. Then something pretty unbelieveable happened. 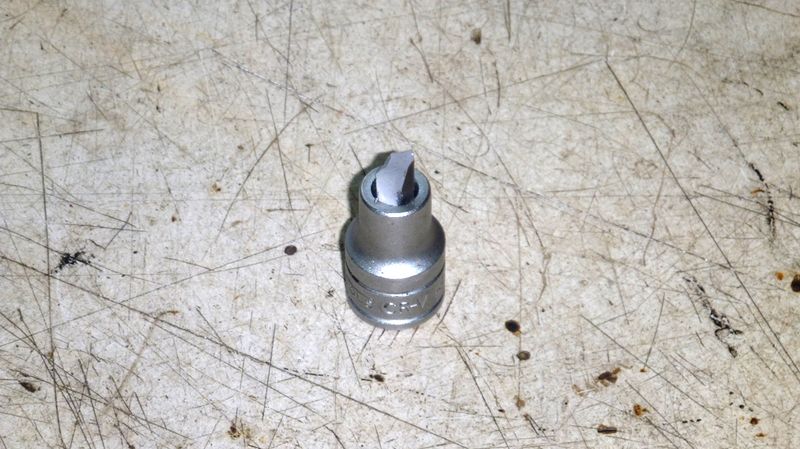 I went to split the caliper and the 8mm Teng allen socket simply shattered. I ended up staggering backwards into LFB (a clutch lever in the spine is not recommended) and at first I thought I'd put too much sideways pressure on the caliper bolt and the head had rounded off. No. A few days later I called the company I'd bought the allen set from; they contacted Teng as it had been some time since purchase and Teng replaced it without demur. No argument there. Anyway, one half of the rusted pin came out but no chance with the other (top right, top pin). You can see the state of some of the other pins too. The pin sticking in that side of the caliper was a stroke of luck for me. That half of the caliper is identical to the F08 used by Moto Guzzi and I have a drawful of dismantled F08, P08 and P09 calipers. Everything was cleaned up and reassembled.'What! No caliper overhaul!' I hear you cry. Wasn't needed - all six pistons slid back flush into the bodies without much thumb pressure at all. I did lift the dust covers to check but there was no dirt or corrosion underneath and long experience with F08s says the inner seal will still be intact and undamaged. I've said before that I really hate BMW's clever idea of running the hydraulics through the headstock. If I want to check the headstock bearings I don't want to have to dismantle the hydraulic system to do it. I went searching for a hydraulic splitter on ebay and found one from an Aprilia Atlantic for £12.50 that looked as if it would do the job. The Atlantic runs a linked brake system much like most Moto Guzzis. When the splitter arrived it was still attached to around twelve feet of braided hose! Waste not, want not... it got converted to new brake lines for Brick2. Now, that wiring loom... a gentleman on this forum persuaded me that it would make a good replacement for the burned-out loom on his K100. We discussed it and I agreed that yes, it would find a good home in the US. Consequently, finding myself loom-less again allowed me to reconsider what I was going to do with Brick2. Originally it was to be a straightforward wash'n'brush up but... I have ideas. I always have ideas. They're not always good ideas but... (again). This time I'm thinking about converting an RS fairing to twin 5.75-inch headlights as a opposed to the single 7-inch round headlight I fitted to LFB. I have LFB's original blue-and-white fairing in the garage roof, but I also lifted an RS fairing top-half from ebay for the princely sum of £42. That came complete with a PowerBronze flip screen on it! Space restrictions on standard K100 handlebars means that on LFB I had been forced to use early Honda handlebar switches because they have the clutch lever/perch built in. Scarcity means that they are now starting to command prices I'm not willing to pay, so I needed to figure out another way around the problem. I wanted to raise the handlebars by 25mm as I had done on LFB for comfort. The instrument housing is still rubber mounted but it's not up to the Dervish dance of the original. The pic also shows the 'new' (as in 'recycled') brake hoses. The splitter is behind that currently ugly plate which won't be visible when the fairing is fitted. The master cylinder is another 16mm Nissin which, I suspect, is going to make the brakes a little interesting at first. But...! It looks like the two together (raising the bars and lowering the panel) have achieved what I was after. The clutch lever is from a Guzzi California 1100 Stone and usefully has a fast idle (choke) lever built in as part of the assembly. It's not obvious from this angle but the clutch adjuster is above the instrument panel and the cable will curve nicely down between the panel and the top yoke. The switch pad is just dropped on and will sit slightly further forward than shown. As mentioned in another thread, I got lucky and found a pair on ebay for £30. Recently I got a pair of S33-grade Goldfren brakepads off ebay for another of those blink-and-you-miss-it prices - £7.50p (the guy was an ex-K100 owner and was selling off spares). As a few minutes break from repairing LFB after its 55mph skating run, I thought I'd just drop a set of pads in the back of Brick2. They didn't fit. I assumed that they were slightly too wide as I'd had this problem with Brembo pads, but after skimming the sides with a second-cut file, they still didn't fit. When I checked properly, it was obvious they were not sitting down far enough and so the pins wouldn't go through. They were exactly the same size as the knackered Ferodos I took out, so this was starting to get a bit hmmmm... Then I noticed that the bottom of the Ferodos had a distinct 'cutaway' in them - this drove me to check the disc and yes, at some point a PO had run some brake pads that were very aggressive and slightly smaller than standard. The disc has a raised ridge around the inner side of the braking area which was preventing the new pads from seating down properly. Bedding the Ferodos in must have been interesting - they had to have been hammered into place. But this means I need a replacement rear disc. Crap. Driven on by stories of starter relay contacts welding together and RickG's comment that it would be better to use a solenoid, I totally lacked the will to resist the idea. b) I preferred the idea of the short and flat cable run to the one of trying to thread three heavy cables and a signal wire through the rubber grommet. Again. That idea was a rare BMW fail. Is the rear disk below the service limit? You could get a step turned down on the disk if there's enough meat on the rest. Cheaper to buy a good s/h disc, Will. The only bit I really hate about changing rear discs is getting the two countersunk allen bolts out. That stems from the very first one I did on a K1100LT; one of the bolts rounded off. I drilled the head off the b*st*rd, pulled the disc and then filed a pair of flats on the stub. I was expecting to have to resort to molegrips but no, it wound out really easily with an 8mm spanner. Ever since then I've regarded them with utter suspicion. Why the hell factory ever used that red loctite on them I dont know all that is needed is to do them up a bit firm to hold the disc while the wheel goes on. BTW if you can get a K1100 disc or a K1200 they are much thicker. @RicK G wrote: BTW if you can get a K1100 disc or a K1200 they are much thicker. Mmm... there's a couple of ABS discs on ebay ATM. Must check the prices. What I did is purchasing 4V disk vor my 2V. BMW 2V K75 + K100 with or without ABS: minimum thickness 3,556mm = 0,14"
BMW 4V with or without ABS: minimum thickness 4,558mm= 0,18"
Careful if you are buying K1200 discs - some can be 7mm thick and won't work with the K100 rear caliper. Oops!!! Hope that wasn't too expensive. As it happens, I'd already clocked the possible thickness problem and have taken aim in the 5mm thickness area, based on disc sizes for the P08/F08 calipers on Guzzis. These have got to be the worst steering head bearings I have ever taken out of any bike. What looks to be red grease is solid shellac. I had fun putting the new bearings in. The lower one came with a rubber seal which, when all play has been taken out of the headstock, makes moving the bare yokes a bit stiffer than I'd like. Even with the forklegs in they don't really respond to the tap/swing test. Well, soddit. I'll see how they feel when I reassemble the front end - if it has to come apart again, so be it. And that's where it stops, for now. 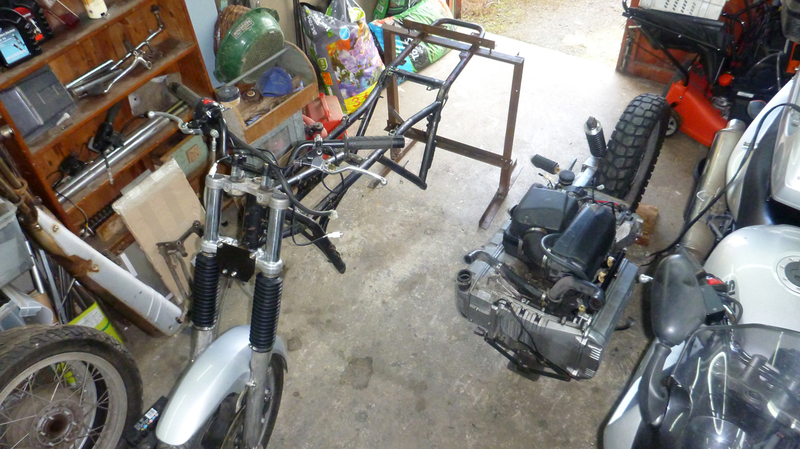 I've just been commissioned to rebuild a Guzzi SP from the proverbial box of bits. On the other thread I said that I thought one fuel injector was probably faulty (discoloured tip) and had probably been causing my diesel knock. However... I did a clean'n'squirt on LFB's ex-fuel injectors and all four fired cleanly. I was using a half-wave rectified battery charger (cheap crap from years ago!!!!) which approximates to 3000rpm - there's a very guilty member on this forum who put me onto that trick! - and not one injector stuttered. I reverse-flushed all four and ran a second syringe-full of carb cleaner through the right way and called them ready for reuse. So... 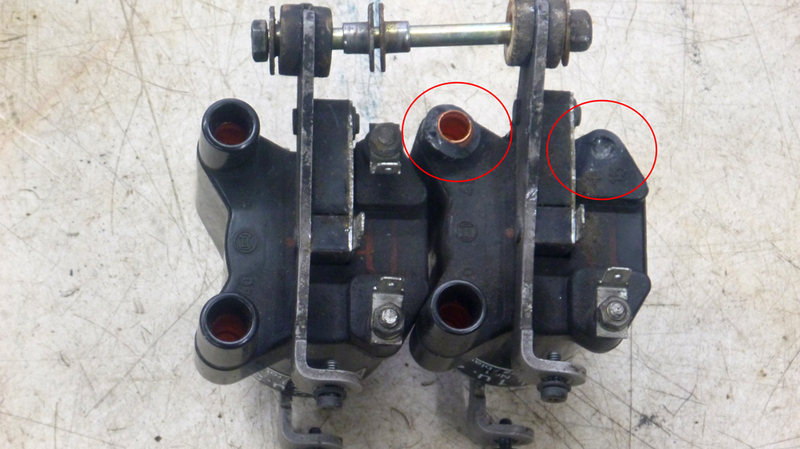 I did note that when I pulled the injectors two of them came out of the engine block very easily. I also recalled Kaptain Hollister having an injector problem which he finally pinned down to the seals having hardened and so allowing air to leak past. Bear in mind that the lowside on LFB would have caused the fairing to punch the fuel rail; add that to four seemingly perfect injectors and I think the source of the diesel knock was mostly likely the same source as KH's problem. Interesting post Dai...so just new o rings and reseat them in the rail ? Effectively, yes, as the spray pattern is spot on according to this page: http://injectortune.co.uk/About.html#Spray (no.5). I'm also replacing the fuel rail grommets as they've rotted away over the years and this should help hold things a little more as BMW intended. A nice bundle of parts arrived from Motorworks on Friday, including a pair of progressive fork springs. I figured that if I was that far into the bike, I may as well change the springs as thirty year old ones tend to be a bit soggy. The forks came apart easy enough; I changed one seal because it looked a bit dodgy where it had been pounded in last time but the other was okay. Alright, if you want the truth I only had one new fork seal. I'll probably regret that. As you know, the standard setup is a shortish spring with a long spacer on top and then the fork cap. These came apart with two spacers in the top but BMW did have a habit of changing fork types, so I wasn't surprised. The progressives replace both the spring and the long spacer. The fork cap is held in with a circlip - no rocket science there. Only, I couldn't get the bloody fork cap in far enough to replace the circlip. I spent over an hour referring to the manual and going back to the fork leg but no way was I going to be able to get enough pressure on that assembly to be able to replace the circlip. Also, the more I read the manual, the less sense something made. There's an 8mm allen bolt in the fork cap though which you're supposed to fill the forks, but the outlet from the hole (inside the forks) was up against the short spacer so there was no way any oil was going to dribble into the forks. Finally, I realised I couldn't find that short spacer on the OEM fork diagram anywhere. Then the candle flickered into life (I refuse to say 'the light went on' after struggling for so long) - a PO had fitted a preload slug under the OEM long spacer. I'd been trying to preload the new progressive spring by two inches for the last hour. So yes, the front end is back in one piece. Here's Brick2 is soaking in a serious coat of Muk-Off degreaser with LFB in the background, covered in shite as usual. The idea is that when it's dried off, I'll lift the frame off the engine (still with the front end on), rub down the remaining loose paint and then cover the lot in brake cleaner to remove any lingering grease. After that, I'll introduce the frame to a pot of smooth Hammerite. 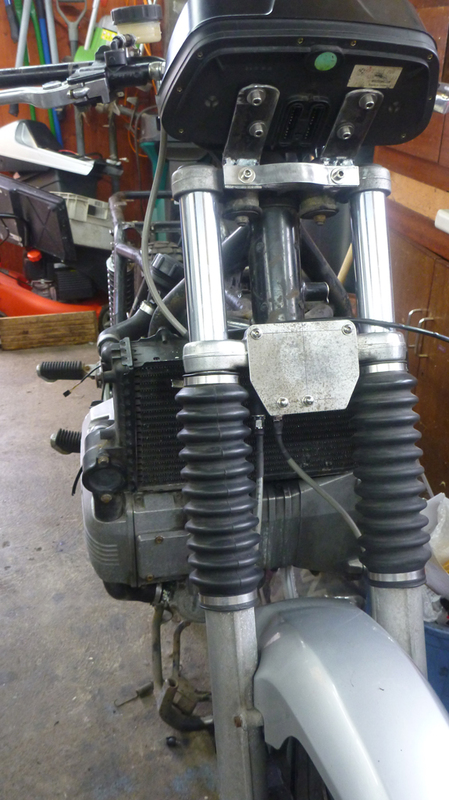 Its coming along nicely, looks very trendy at the mo, did you loose ony paint from the injectors when you did the carb clean? No - the paint was immune to the carb cleaner. Ready for paint. This is the Mk.2 rear support, complete with Bill's suggested top clamp. I've also added a corner brace (bottom-left) for better rigidity. I suppose I should paint the stand while I'm doing the frame... 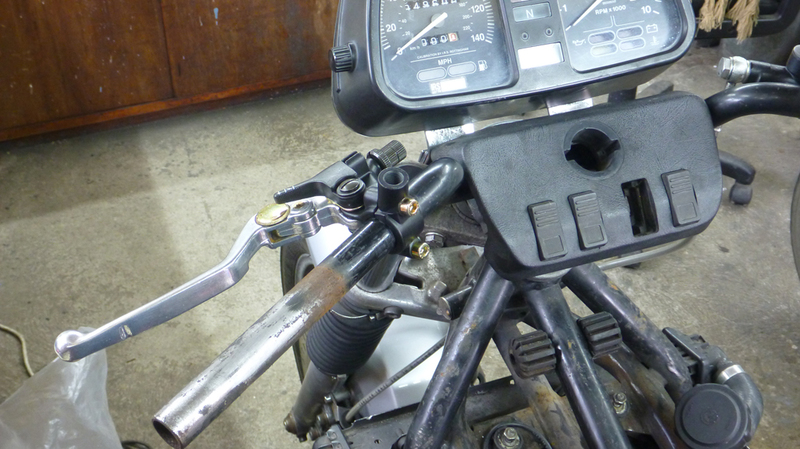 I can touch up the bits held by the clamp when the frame is back on the engine. After a discussion about Hammerite-ing the frame on another forum (which consisted mostly of NO! Don't do it!!! ) I've ordered a litre of grey zinc phosphate brush-on primer and 500ml of brush-on semi-gloss black enamel. Should be enough to do LFB when that becomes due too. +1 for me on the Hammershite! - Don't do it! Two coats of zinc phosphate later. The first coat didn't 'take' in places and I wasn't too sure if that was the result of missed grease streaks or because I hadn't stirred the paint enough (most likely), so I left it overnight to go completely hard (10 hours according to the can, left it for a day). I then rubbed a lot of it back to the original paint/metal and coated the whole lot again. Of course, this time I collected a whole load of runs too as opposed to bugger-all on the first coat It gets two weeks to go hard this time as that's the earliest I can get back to it and rub it down again before enameling it.